Celebrating the elegant fusion of luxury home, fine living, food and travel, THE ADDRESS Magazine is inspirational, inviting, informative and influential. Unreservedly upscale, the publication is an inspirational source of information for sophisticated property buyers looking to purchase outstanding homes across the world. Besides a curated collection of luxury properties for sale, each issue features sought-after communities, market insights, stylish living, food and travel. 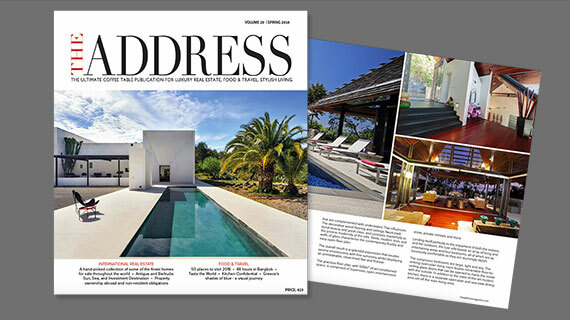 Defining the art of fine living, the THE ADDRESS Magazine is full of style, beauty and luxury. With its stunning design, oversized format and high quality content, the luxurious lifestyle and real estate magazine is the very essence of style and sophistication. Produced since 2008, THE ADDRESS has become one of the foremost publications in the field of luxury real estate and fine living, and is considered a must-read for the world’s sophisticated consumers. A mix between a magazine, a book and ‘a piece of art’, the ‘glossy’ publication sets the benchmark for great reading and innovative sleek design in a digital format. With sterling editorial content and award-winning design, the compelling luxury publication is completely unique to its category. Intended for an audience interested in living the good life, the upscale lifestyle magazine is dedicated to luxury homes and prestige properties for sale worldwide, as well as food, travel and style. Combining world-class imagery with inspiring and engaging writing, each issue of the magazine showcases more than 400 pages of information and editorials. It comprises four main editorial sections; Luxury Real Estate, Market Insights, Food & Travel, and Curated Objects of Desire. The luxury property section focuses exclusively on the finest homes and developments across the globe for investment, lifestyle, rental and retirement purposes. Luxury real estate offerings include urban residences, ski chalets, waterfront villas, exclusive penthouses, golf resort properties, vineyard properties, country homes, equestrian estates, historic castles, prestige properties, golf resort properties and modern villas for sale. Readers will also find signature properties for sale including a Pièce de Résistance Residence, Best of Modern, Trophy Property, Best Development and Best of Skiing. Take a tour of some of the world’s most beautiful homes through striking photography and fascinating prose in THE ADDRESS Magazine. From the Caribbean to Europe to South East Asia, the world is covered with style and panache. The Market Insights section, including country reports and buying guides, is a must-read for anyone serious about investing in a property abroad. The magazine offers distilled advice from a mix of expert sources: acknowledged solicitors, taxation experts and wealth managers, all with detailed knowledge of their topic. The Travel section celebrates the extraordinary, the priceless, the unique – from safaris in Africa to Caribbean chic to the magic of the Arctic, and everything in between. This section enhances each issue with personal editorial, outstanding photography, and innovative, informative articles. The selected vacation rentals, that are being selected for THE ADDRESS Magazine, are singular, memorable and definitely worth writing home about. The regular feature “Epicurean Travel -Taste the World” showcases everything from triple Michelin-starred restaurants to temples of modern cuisine, to undiscovered gems. The articles also uncover the best food markets, artisans, and shops for cooks. In each issue of THE ADDRESS Magazine, there are also fascinating interviews with leading chefs who share their thoughts and insights of building and growing a stellar career in the kitchen. The Curated section provides a tightly edited selection of discoveries for stylish living, travel, well-being and beauty. From haute to homey, privileged to practical, inspirational to intelligent, the magazine is selecting timeless classics to unknown gems. The real estate magazine has been beautifully designed for an international audience, consisting of a loyal following subscribing to the pursuit of an ultimate lifestyle. It has a distribution of over 15,000 subscribers in more than 100 countries, ranging from Argentina to United Arab Emirates to Vietnam. Approx. 40% of its readers being in the UK & Europe, and the remainder is split between North America, Asia and Middle East. Launched in 2008, THE ADDRESS Magazine is considered to be a one-of-a-kind publication for international luxury real estate. THE ADDRESS Magazine is published tri-annually: Spring issue; Summer issue and Autumn/Winter issue. The luxury property and lifestyle magazine is published by Select International CB, www.select-international.com. Deemed “the Coffee Table Magazine” by its readers, THE ADDRESS’ elegant format has a smart freshness throughout the pages, which captivates our discerning readers. As a style leader, the magazine has been honoured with the coveted Hermes Awards for outstanding design and editorial creative excellence in 2012, 2013 and 2015. The website – www.theaddressmagazine.com – complements the digital publication, providing readers a trusted source about luxury homes & living throughout the world. This authoritative and captivating resource contains almost 1,000 articles, that are available on the searchable website. In 2013, THE ADDRESS Magazine celebrated its 5th anniversary by publishing a special edition called “The Very Best of TA 2013” – 780 pages of luxury real estate, property market insights and food & travel features. “THE ADDRESS….such a clear, strong and wonderful vibration of sheer quality and classic elegance of every page.